This lovely detached,air-conditioned villa offers a perfect getaway for a peaceful, relaxing holiday.Internet available.Sitting at the head of a tranquil valley with unobstructed views, overlooking grapevines and olive groves. The sun-drenched patio and terraces surround the private pool and are south facing with ample seating and sunbeds etc. We are located in rural Paphos, so a car will be essential if you wish to explore the many surrounding villages. You may wish to sample the delights of Cyprus eating (try the Meze) and drinking at the numerous Tavernas just a few minutes’ drive from the villa. Paphos town is where you’ll find hundreds of bars, restaurants and clubs catering for every taste and is about a 20 min drive. The picturesque harbour is lined with places to dine overlooking the sea and old fort. With many archaeological sites, Paphos is steeped in history. Polis and Latchi (fishing harbour) are charming coastal villages with wonderful fish restaurants and long beach just 20 mins. Hi, my name is Alan Bradbury, or Brad to most. I'm 60 and live in Exeter, Devon, a lovely part of the U.K. where i have spent most of my life. I have worked for many years as a musician both at home and abroad. I decided about 10 years ago to embark on a little adventure and the result was the building of a lovely villa in Paphos,Cyprus.I lived and worked in Cyprus for a few years but work commitments brought me back to the U.K. With the villa now unoccupied I decided to let it and have done so successfully for several seasons. I hope to settle in Cyprus eventually. I bought this spacious property for it's peaceful location and the wonderful views across the Paphos landscape. Most grocery needs can be found just a couple of minutes drive away along with various tavernas. We pride ourselved in presenting the villa to our guests thoroughly cleaned and with a welcome pack of provisions to get them started. The property is furnished to a very good standard unlike some rental properties. Bathroom 1, en-suite to bedroom with shower. Bathroom 2, en-suite to bedroom with bath. Washroom, wc and wash basin off main accommodation. Lounge area is large, bright and airy, windows have lovely views, patio doors to pool, air-conditioning, Satellite TV with English channels, CD DVD and a selection of DVDs, luxury leather sofas, heating. Large well equipped modern kitchen, fridge, freezer, cooker, hob, hood, microwave, table and seating for 6, breakfast bar. Tsada golf is about 6 miles away, 7/8mins by car, and is Par 72, 6060m. Secret Valley Golf, approx 40 mins, Par72, 6060m. Aphrodite Hills Golf, approx 40 mins, Par70/71, 6232m, and championship standard. First feeling was of being out in the sticks, but after a couple of days we began to appreciate where we were and that it was so peaceful and with lovely views as well as being slightly cooler than down on coast. The food package was perfect to tide one over to next day. The villa is spacious and very clean with nice large patio and a pool suitable for swimming rather than being a plunge pool . Local tavernas were great and it was nice to be mixing in with the locals. We spent a very relaxing 2 weeks at this spacious villa. The views over the valley were superbe. A car is essential as the main tourist areas of Paphos, Coral Bay, Polis and Latchi were all approximately 30 minutes away, but this meant we could retreat away from all the hustle and bustle to the tranquility of our own pool. The gas barbecue was very useful, and the air conditioning was very welcome. The local supermarket and taverna were very friendly. We would gladly return one day. Thank you. 4th stay in this fantastic villa. 2 fantastic weeks in this villa. our fourth time. welcome pack on arrival. inside and outside spotlessly clean. pool area and garden peaceful and well laid out. view is to die for. car needed as it is 40 mins to nearest shop walking. We were really surprised & pleased by how lovely this villa is. The photographs do not do justice to the villa or the wonderful views. The villa was clean & well presented on arrival with a welcome pack to tide us over until we got to the shops. The two bedrooms were spacious & both had good en suite facilities. The pool & surrounding area were well kept & a joy to relaxing in the sunshine. You will need a car to really get the best from this part of Cyprus. Polemi has a good traditional Taverna or you can go to Letymbou for the Letymbou Tavern or the British owned Vineyard Taverna both are highly rated on Trip Advisor so well worth a visit. We also visited the Tsangarides Winery where they gave us samples of all their excellent wines. I cannot recommend this villa highly enough for anyone wanting a relaxing visit to the real Cyprus. Thank you so much for taking the time to write your review . I'm sure it will of great help to prospective guests viewing our villa to see your comments. Great villa hidden away in the Happy Valley. The views were amazing & the photos just don't do it justice. We arrived late at night & were pleased to find that everything was just as described on this site. You need a car to get the best from this villa as there are shops & good restaurants in Polemi but go further afield to Letymbou & you are treated to the Letymbou Tavern or the Vineyard Taverna. Both restaurants are well worth a visit. The pool was well situated & a treat to use in the hot weather while we were there. I really appreciate you taking a few minutes to post your review, your comments will be of great interest to anyone considering our villa for their stay in Cyprus. great directions from owner .welcome pack. competively priced. a home away from home. very well equipped. lovely pool . shaded area if you don't want too much sun. great pool an garden. will highly recommend. 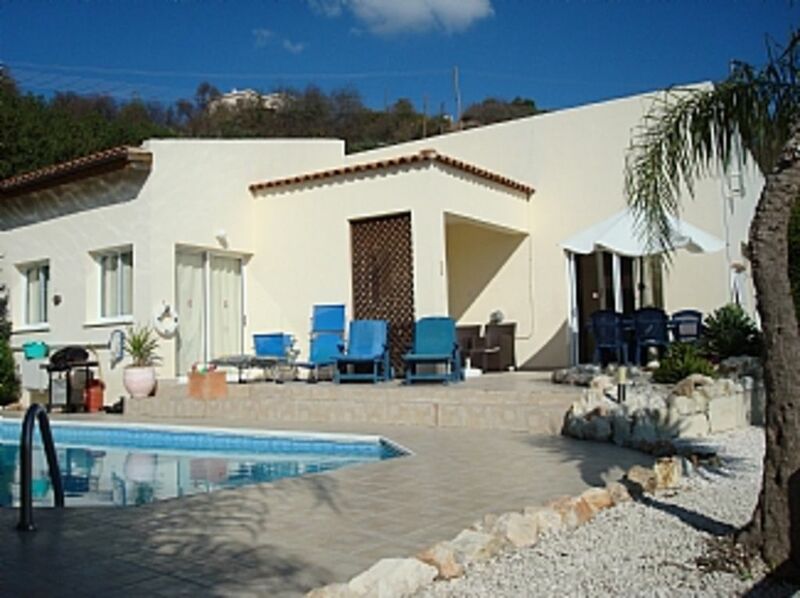 The villa is in a rural location, beaches are located in Paphos approx 25 mins. The very popular Coral Bay approx 30mins, and Latchi and Polis, approx 20 mins to the north. There are plenty of water sports facilities, boat hire, jet skies etc for hire on the beaches. Aphrodite Water Park is about 30 mins. Journey time from Paphos airport is approx 30 mins. Larnaca Airport is approx 80 miles. Limassol Port is about 1 hour 15 mins. Short cruises to Egypt and Holly Land depart here. Due to villa location, car hire is recommended and can be waiting for you on your arrival at the airport. We can offer assistance regarding car hire. Villages are too numerous to mention, all within short driving times of the villa. The nearest being just 1.5 miles. The summit of the Troodos mountains is approx 1hour 30 mins. The capital, Nicosia, is approx 2 hours. Small supermarket shops are in the nearest village, Polemi, just 1.5 miles away and will have a good supply of provisions, here also you will find several tavernas. A welcome pack of basic food and drink essentials is provided on arrival. Booking Notes: Bookings require 25% cheque deposit and is non-refundable. Payment in full 8 weeks prior to arrival. Long winter lets negotiable at low rates. £100 is required per booking as security, this will be returned assuming no damage has been caused to the property. A/C is optional and charged @ £40.00 p/w Changeover Day: Changeover days are usually flexible. Villa to be vacated by 10am on departure day.